Miranda Chavez was 8 years old when she walked along the sandy shore in Edisto Beach, South Carolina, with her parents and a glass bottle in hand. 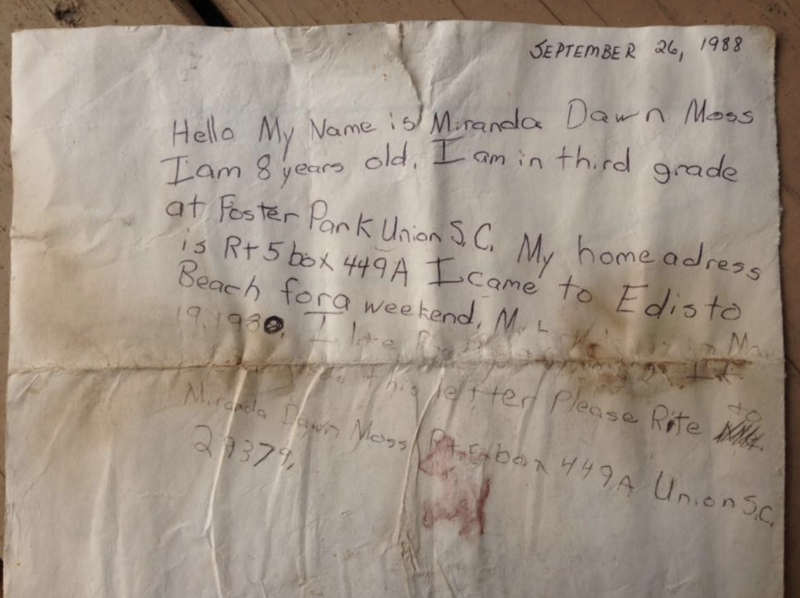 Instead of writing a letter to a pen pal, like other third-graders in her class, Chavez went a different route — she put a message in a bottle and tossed it into the ocean, hoping someday she'd get a response. That was on September 26,1988. "I remember my mother being really insistent on writing the date on the note for me," Chavez told CBS News. "I threw it as far as I possibly could. I was afraid I would leave and it would wash back up on shore." The letter didn't end up on shore. Instead, it drifted about 90 miles away to Sapelo Island, Georgia. Linda Humphries and her husband, David, discovered the bottle 29 years later while doing a beach sweep on Saturday. "We have a current name and city for the now 37 year-old sender, but any phone numbers we've found were dead ends," Humphries wrote in a Facebook post. "Will keep trying." Hours later, she got in touch with Chavez and told her about the old crinkled letter. Chavez couldn't believe it. She was certain the bottle was lost and buried after Hurricane Hugo slammed into South Carolina in 1989. "But the moment I looked at it I knew it was mine," Chavez said. "Granted, I had forgotten about it. It had been 29 years." Chavez moved out of her childhood home when she was a teenager. In fact, the address on the letter doesn't even exist anymore. "That was so long ago," Chavez said. "It would be pretty difficult to find me." Luckily, the power of social media brought the pair together. "Who would have thought? It's so awesome how something that small — no matter what you've got going on in your life — can take you back to your childhood and to some of the absolute happiest times of your life," Chavez said. Since Humphries posted about the 29-year-old letter, Chavez says she has been contacted by several former classmates. "I lost contact with all of those people when I moved from that town," Chavez said. "Not only have I made new friends, like Linda and David, but I've also been able to reconnect with people." Chavez says she's already made plans to meet Humphries and her husband in the coming weeks, and she also hopes to visit the island where her letter was discovered. "It was meant to be found. It was meant to do something, even if it was just to have people have something positive to say for a few days," Chavez said. "I guess it served it's purpose."